The first in a new network of large-format digital advertising screens to be installed at UK Roadchef Motorway Service Areas has been unveiled at the Strensham Service Area on the M5. 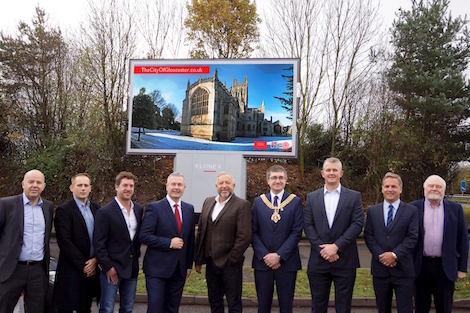 Representatives from Roadchef and screen operators Elonex were joined by officials from Gloucester City Council and Marketing Gloucester on Monday November 14, 2016, as the new screen at Strensham went live broadcasting advertisements promoting local visitor attractions in Gloucestershire. The new screen at Strensham launches an exciting and commercially innovative project, which will see digital display technology specialists Elonex manufacture and install large-format, Digital 48 Sheet screens at all 30 service area locations operated by Roadchef across the UK. Each of the Digital 48 Sheet screens will measure 18 square metres, and, with a 12-month installation programme now underway, will form a unique digital advertising network at British service areas. The screens are to be strategically located at busy entry and exit points at Roadchef motorway service areas, and will feature the very latest in Elonex P8 High Density LED visual technology. Roadchef attracts over 50 million visitors per year and its estate includes some of the UK’s most iconic motorway service areas. Watford Gap, the first service area to ever open, is part of the estate, whilst many high profile brands such as McDonalds and Costa Coffee can be found at Roadchef service areas. The new screens will broadcast a mixture of commercial advertising, visitor information and Roadchef promotional content. Elonex will hold exclusive advertising rights on the digital screens and be responsible for advertising sales across the new network. Advertising packages are set to be made available to national brands looking to target all 30 locations, whilst airtime will be reserved for local businesses wanting to be seen at individual service areas or in specific geographical areas.